Last Friday I received a truly magical box in the mail. I could hardly wait for my son to get home from school so that he could open it. 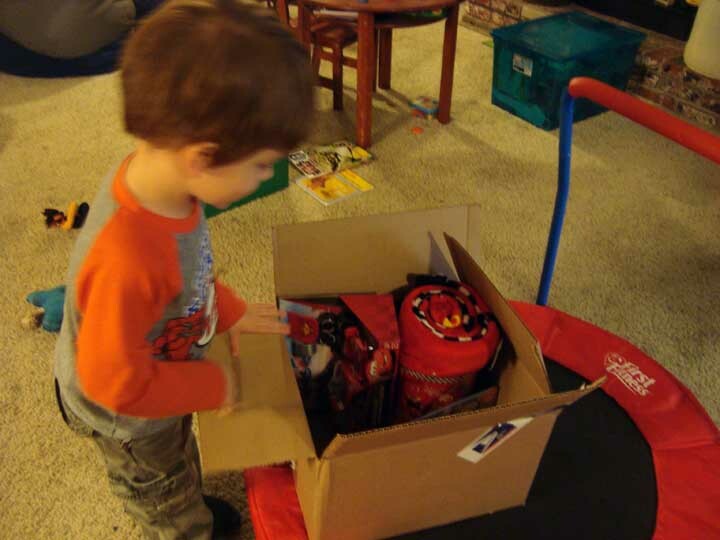 Wyatt opens the exciting box of goodies sent by Disneyland! The wonderful execs at Disneyland HQ were kind enough to respond to my recent letter with sincere concern. They expressed their heartfelt apology that we had such difficulty in obtaining our son’s GAC and made a commitment to improve training efforts for all of their cast members. In fact, they even stated that they planned to use my letter as a training tool to emphasize exactly how such unintended bias can enable this type of discrimination and hope that its emotion will reach City Hall cast members while creating more awareness.There is a new president at Disneyland, since this February, and I feel hope that he realizes this is an issue that he should champion. I am also hopeful that my message was truly heard by many leaders at Disneyland HQ and am overjoyed that they also see these concerns as a means to do more good, becoming heros to all children with disabilities – whether physical, visual, auditory, or neurological. 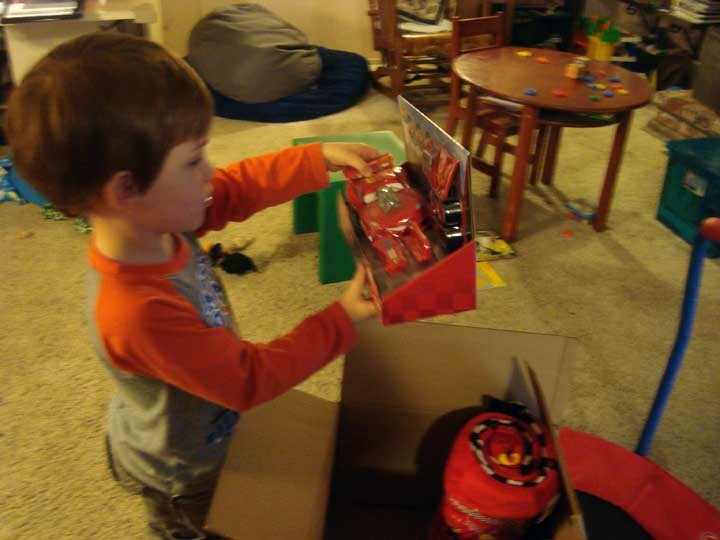 He has not stopped playing with this cool McQueen car with interchangeable parts! 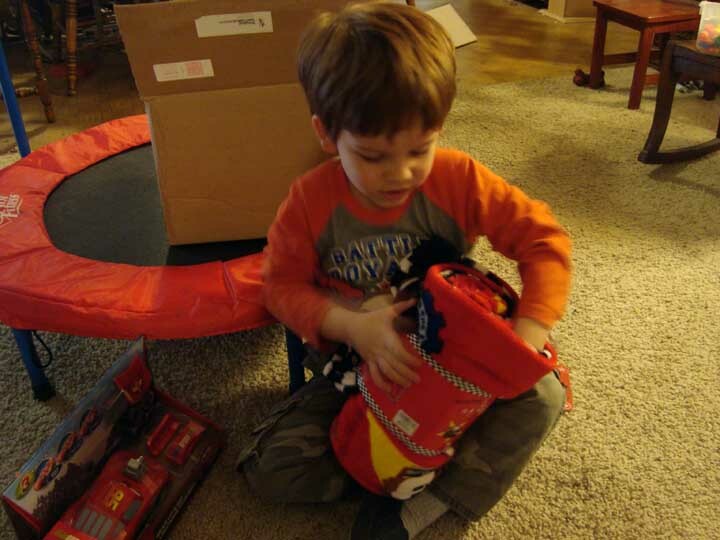 Not only did Disneyland send my family a set of tickets for a “do-over,” they also forwarded a care package full of special goodies for my son Wyatt. I was touched deeply by their sincere desire to make this right and their willingness to continue working on the issue – so that future trips to this amazing park are not fraught with skeptical glares from City Hall cast members. A soft & fuzzy blanket from Car’s Land! I’m so glad to find out that even one of the most profitable corporations still possesses so much heart. Last, but not least, some awesome Mater teeth! I also had a problem not getting the pass as my son is now 17 and it has become obvious he is autistic…… he is still in depends and likes Barney, still has few words….. he is severe………. I also had someone help me , finally , after a woman told me Disney was not for my son, I got her manager and he helped. He sent tickets for a do over and a letter that he will help with fastpass type things for cars land and to get us into world of color since we were never able to go to it due to a wait etc. ……………..
well, I hate to tell you this but WYATT will NOW have to stand in LINE………….. they have taken away the GAC ……… guest assistance cards GAC…….. google it. You have to go to a ride, make an “appointment” to get on, you get a time to come back, you have to have the handicapped person with you to get a time and at city hall they take their pic for a ticket so they know it is him. …………… you can only do ONE ride at a time……… Disney suggested going to a gift shop while you wait. FIGURES! ………… so, you will be in a regular line, or standing somewhere waiting for a few hours for your appointment time. this is something I wrote to sign a petition to keep the GAC. please sign it! I’ve been heartbroken and in tears knowing we will no longer have family vacations… vacations at all since we are the only family left for our son with nobody to watch him except us. The woman when I called told me that Disney was not NOT for my son (we had gone so many times so this is crazy, plus he does well at Universal but we pay extra for the vip pass) and that the only place I can take my son is the beach !! OMG I was in SHOCK! I told her off and hung up crying, called back the next day after crying all night and asked for a manager. I got a man named Britt who helped……… he sent a letter to call him and he can help us when we come back. ………. I called yesterday and left a message, then today twice. I left a message with a woman at the regular number ……. I did leave a voice mail message directly to him……. no call back……………. figures. I’ve been nice and now I’ve also gone to Disneyland.com and emailed them twice! Like parents of special needs kids are not already secluded…………….. I am so sorry that you had such difficulty and know how frustrating this can be. It’s hear breaking when our children experience these meltdowns and I’ll do nearly anything to deflect such disaster whenever possible. I agree, Dland was the one place where we felt like a “typical” family for the day. The GAC accommodations helped to make the experience magical for my son and I am overjoyed when I see that spark light up in his eyes as he awaits the Nemo submarine, our turn on Pirates of the Caribbean, and other favorites. There is nothing better. I am disappointed and shocked at some of the animosity directed toward us and our children regarding the receipt of GAC accommodations! I’d wait in 1000’s of lines if it would change my son’s disability and challenges. I’d wait in many crowds if he no longer had to work an extra 20 hours each week after school to learn basic skills that come naturally to neurotypical children. The entire debate makes me sad and even angry. I am watching this closely and have been on the phone with Dland a few times, but don’t get any real information from them. The week before last, they were holding fast to the fact that “this is merely blog rumor,” then, I called them to confront the recent article in the Orange County Register that even featured a quote from a Dland representative and they confessed that they were caught before they were ready with this information leak, but they can’t divulge specific details because they are still in development. I think the best advice here is for all of us to write, call, and sign any petitions out there to voice our concerns and feelings on these matters. Of course, there is no guarantee that they will heed our advice, but an avalanche of feedback can’t hurt! I am mailing paper letters this week to their management team and would be happy to share the names and address with anyone that wants to do the same. I hope and pray that our family’s ability to enjoy this park doesn’t change in the manner that’s already been announced online. I hope that Dland is listening…and if they’re not, I hope we’re all ready to band together and let them know how outrageous and uncaring these changes are. Wonderful! I’m so glad, not only for your family but others with Autistic kids as well. Good job. I am glad they made it right but I am so afraid of repeating your experiance. I am taking autistic twins in June. Any advice? Hello! I’m so sorry to respond to your comment late. 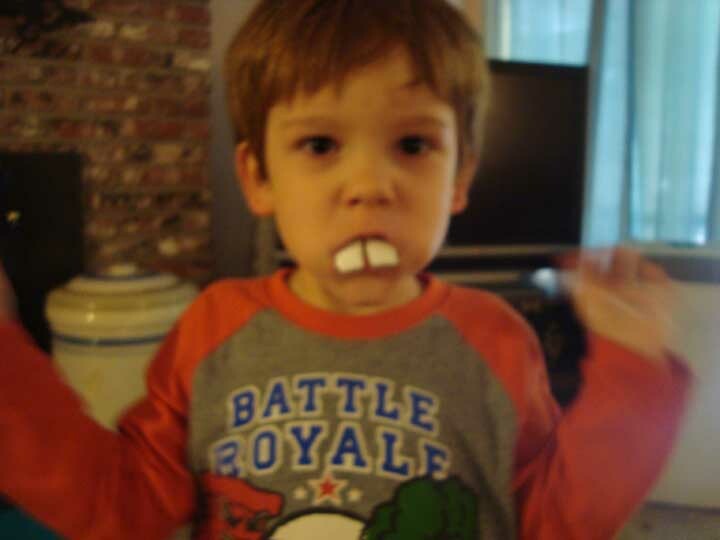 I’ve been bogged down with computer woes & IEP preparation for my son. My best advice on the Disney trip would be to remain firm in what you request for your twins and use very specific wording. We always request a Guest Assistant Card with these designations: Guests can use their stroller as a wheelchair. Guests can use an alternate attraction entrance, where available. We request these two stamps for our entire family of five, so that we can experience various attractions and rides together. Being able to use our stroller as a wheelchair means that we can bring it right to the ride. The stroller provides a safe haven for my son during times when he might be feeling overwhelmed by nearby crowds or sensory input. Having the stamp that allows an alternate attraction entrance means that you can wait in a quieter area – a bit off from the crowd and helps our son to experience so much more throughout our visit. There’s no point in bringing medical documentation to City Hall because they will not read it due to their medical privacy policies. If the agent you encounter is not willing to provide these concessions for your family, stand firm and request a manager – continue to push and you will get what your children deserve from them. Sadly, the language that has been most effective in our past experiences has been my husband’s statement of, “This is NOT the happiest place on Earth today!” For some reason, that little gem worked like a charm to encourage them to do what’s right and issue the pass as we requested. Do not accept an explanation of, “This policy is no longer provided…we don’t give out alternate entrance passes anymore… This is how they tried to avoid the matter with us, however, when my husband went back to City Hall and persisted, they finally provided the pass with the “eliminated” stamp. I wish you good luck and hope that your twins love the experience! My son talks about Disneyland every night before bed – it’s his favorite place on our planet! Please see my reply above about the passes……… they are not giving them at all to anyone now! Yes, I’ve been watching this closely and have phoned Dland twice in the past week. I’m very disappointed as well and have not been able to get much helpful information from any of my phone calls. I have voiced the concerns and PR disaster that this is sure to become. I can only hope they are listening and plan to write a more lengthy post very soon. Life has been chaotic and super busy, so I’m behind on my blogging. There is so much to catch up on here. I truly hope that Dland does not shut out accommodations that make it possible for my son to enjoy a future trip. I think this whole mess is terrible and feel like our children are being punished instead of the fraudulent people who took advantage of the GAC system. Your child cannot cope with crowds, loud noises and waiting his turn — and yet you take him to Disneyland, which is pretty much crowded, loud and there are lines galore. It sounds like an autistic child’s definition of hell. Surely there is somewhere quieter, less crowded and with fewer lines to take your kid to. Candace, shockingly my son is severe and LOVES Disneyland etc. The rides do something to him. I only go when there are not many people. (I am not the original person who wrote here but did leave a comment above)…………. when we see a huge crowd, we go around. The noises, we put noise canceling earphones on and he does wonderful…….. we do not go to the extremely loud stuff and on the jungle boat he knows when he sees the gun and just pushes his ears tighter. Waiting turn, well, we don’t get to see parades and things like that, we pay for fantasmic to sit and not wait, other then that, we take a portable dvd player and go to first aide for time out. That is also how we are able to eat out, the dvd player. These kids are unpredictable and you never know but the rides and Disney has a magic for them. The guest assistance pass let them in rides through a quiet uncrowded line that was a less wait. If it looked long, we would cringe and hope…….. now, due to people taking advantage and faking handicaps to get these passes, they are taking them away from all. I hope your not so mean in a response in the future…….. it is hard for autism spectrum parents to go ANYWHERE………… Disney was a place we felt safe……………..
We took our son to VEGAS even and he loved walking and seeing the lights! We weren’t able to do much but, he liked it and we were out………………. I’d also like to add, we used a stroller until he was too big, then a transfer chair,,,,,,,,, may need a wheelchair now since he is so big but I’m in a leg brace and not sure I can push it……….. however we will be going to sea world now not Disney. Are Today’s Medical Heroes Only Found on TV?